MEMPHIS, Tennessee, February 23, 2011 (ENS) – Ducks Unlimited is planning a new wetland restoration project for Upper Peoria Lake in central Illinois, the national waterfowl and wetland conservation organization announced at the Illinois DU state convention on the weekend. “This project will showcase how wetland habitat restoration along the Illinois River provides a multitude of conservation and economic benefits,” said DU regional biologist Eric Schenck. 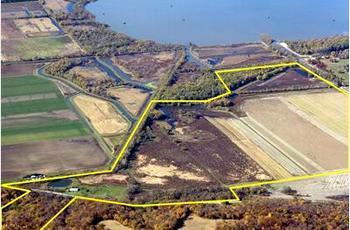 DU purchased 237 acres on the east side of Upper Peoria Lake in early December. The site includes a forested bluff, a wetland fen, bottomland forest and more than 100 acres of restorable wetland habitat that Ducks Unlimited is calling Jenkins Marsh in honor of the family who sold the land, said Schenck. The decurrent false aster, a federally listed threatened plant, grows on the property. Schenck said the restoration will improve water quality in Upper Peoria Lake by trapping nutrient and sediment runoff from adjacent farm land and tributary creeks. Ducks Unlimited intends to manage the property as a waterfowl refuge for the Woodford County State Fish and Wildlife Area. Eventually, DU hopes to designate a portion of the site as a waypoint on the Illinois River Road National Scenic Byway to attract visitors and expand the local economy through nature-based tourism. DU used nearly $1 million in grant funds from the Grand Victoria Foundation, Illinois Clean Energy Community Foundation and Doris Duke Charitable Foundation to purchase the Upper Peoria Lake property, and Schenck says more funding will be needed to cover future restoration costs. DU has announced its intention to raise $5 million in private and public funds over the next five years for wetland conservation projects surrounding Upper Peoria Lake. Established in 1937, Ducks Unlimited is a giant among land conservation organizations, having protected more than 12 million acres with contributions from more than a million supporters across North America. This is the kind of activity that this month earned Ducks Unlimited accreditation from the Land Trust Accreditation Commission. Wetlands America Trust, DU’s supporting foundation that raises philanthropic gifts and manages DU’s endowments and land holdings was also accredited. Based in Saratoga Springs, New York, the Land Trust Accreditation Commission was incorporated in April 2006 as an independent program of the Land Trust Alliance. Its accreditation program recognizes land conservation organizations that meet national standards for excellence, uphold the public trust and ensure that conservation efforts are permanent. “The Land Trust Accreditation seal signifies that both Ducks Unlimited and Wetlands America Trust operate under the highest legal, ethical, fiscal and procedural standards,” said Darin Blunck, DU director of conservation programs. The commission accredited 17 land trusts on February 9, bringing the total number of accredited land conservation groups across the country to 130. Governed by a volunteer board of land conservation and nonprofit management experts, the commission conducts an extensive review of an applicant’s policies and programs before conferring accreditation and the right to display a trademarked seal. Click here for a list of all accredited land trusts.